The Wolf of Gold Street: Making it BIG on Gold Street with... Jewelcrafting! Making it BIG on Gold Street with... Jewelcrafting! So you have come to me looking to hit the jackpot on Gold Street. Well one of MANY way's is Jewelcrafting. I will go in-depth with how to maximise profit with this wonderful profession! So to start off you want to grab a mass supply of Ghost Iron Ore - GIO. 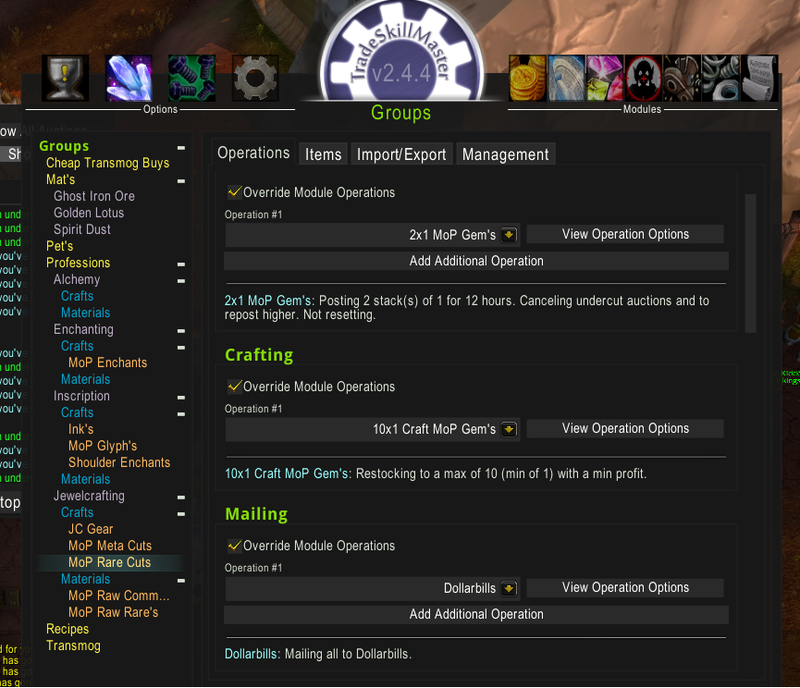 You can do this multiple ways, you can bark in trade chat with Guild Recruitment Helper for cheaper GIO or you can buy off the AH normally a bit more expensive but easy to get and mass supply. Once you have spent your gold on GIO you then want to prospect ALL of this GIO into gems / serpents eye's. Now you have uncommon gems, rare gems and serpents eye's. With the rare gems you want to cut these into the MOST profitable gems on your server, you can find out how much profit you will make per gem with TSM (Check out Phatlewts video guide for TSM help) and craft the best gems for highest profit. When crafting I personally craft a max of 10 gems of each cut and post 2 at a time, the reason being for 2 at a time is because then I can repost 5 times before I have to cancel and collect my gems to repeat the steps for the AH undercutting business. With your uncommon gems if you have Alchemy you want to be prospecting all of these into rare gems. Only do this if you can get your golden lotus for around 30 - 34g per (Around 600g/stack). This is a much better way to get the gems you need rather than hoping you get enough of the gems you need from prospecting. But is slightly more expensive depending on your server. You should be keeping ALL of your serpent's eye's and using these to craft the MoP JC gear (neck and rings) On my server this gear varies from 200g - 600g (With outliers at 2.3k but rarely sell). Because these are slow sellers I restock on these very slowly but I craft ALL the time. I send any excess to my enchant and disenchant for Ethereal Shards which I then use to make enchants. You can also post these on the AH for a decent amount (Nothing crazy) if you do not have an enchanter and do not wish to craft gear, you should be able to get a decent profit out of this compared to vendor price. But be careful not to post the price too high otherwise nobody will buy them! Be sure to follow me on twitter @DollarbillsWoW for gold updates and tips!